Although tall fescue tolerates low fertility, it responds to fertilization, particularly nitrogen. About 3 lbs. of actual nitrogen per 1,000 sq. ft. per year is adequate. Apply a complete fertilizer according to soil test recommendations in the fall (September) and late spring (May) at a rate of 1 lb. of actual nitrogen per 1,000 sq. ft. Apply nitrogen alone at the same rate in February when the grass is actively growing. A summer application of 0.5 lb. of actual nitrogen per 1,000 sq. ft. may improve the color of the lawn. However, avoid overstimulation of the turf during summer months from excessive fertilization as this only adds to heat and drought stress problems. 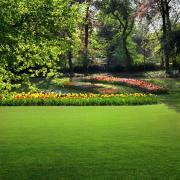 In shaded lawns, avoid summer applications of nitrogen. Combat Extreme™ Northern Zone - This tall fescue and Kentucky Bluegrass mix produces fine to medium leaf blades which allows a dense turf to form. In addition, Combat Extreme™ grass seed mix uses lower-growing cultivars which means that mowing requirements and clipping yields can be reduced up to 30 percent. 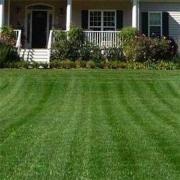 This lawn seed for cold weather is excellent choice for professional or home use. Combat Extreme™ Southern Zone - This a 3-way mixture of turf type fescue and hybrid bluegrass which is heat and drought tolerant enough to be used in USDA Zones 8 - 10 (partial shade recommend for USDA Zone 9 and 10). This grass seed mix produces a dense turf grass that has excellent heat tolerance, withstands high traffic, and is disease resistant. This grass seed is an excellent choice for southern climates that have partial shade. Combat Extreme™ Transition Zone - This is a 3-way turf type fescue grass seed blend that produces grass with fine to medium leaf blades which allow it to form a dense turf. 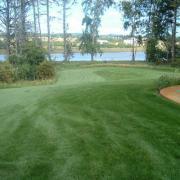 Turf type fescue is often used as a shade grass in the Southern U.S.. 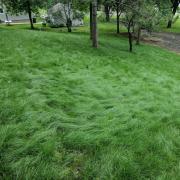 Creeping red fescue grass seed is an important member of the cool season grass family. 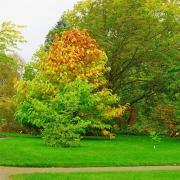 It is a beautiful shade of green and will maintain is luxurious color without extra fertilizer. Creeping red fescue has the ability to spread and creates excellent lawns, golf greens and turf for ground cover in landscaping. It is also an important grass seed for shade and performs even on sandy soils. Hard fescue is noted for its low growing habit and darker green color making it a premium grass for both low maintenance sites and as part of a high quality lawn mix. Oxford and/or Eureka II hard fescue contains very high levels of viable endophyte giving it natural insect resistance and the ability to persist in adverse environmental conditions. Hard fescue grass seed is an excellent choice where erosion control is the primary focus or in areas you do not want to mow. Legacy is our premier fine fescue grass seed blend with three different varieties to give you the best turf possible. This elite blend combines hard fescue, chewings fescue, and creeping red fescue to give you the immaculate fine fescue lawn that you have been looking for. Also makes a great shade grass! Sheep's fescue is a drought-resistant bunch grass, somewhat hardier than any of the other fine-leaved fescues. Like hard fescue, this species does not produce much usable forage, but it provides excellent ground cover. 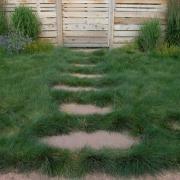 It is often called Blue Sheep fescue or Blue Sheep's fescue due to its bluish-green colored grass blades. Sheep's fescue grass seed is a great choice for naturalized areas.